Welcome to Week 1, ICM820. This week’s goal is to analyze the idea of a community with a broad lens. We are going to examine the idea of community from a historical perspective. In order to analyze the present, and to predict the future, we need to know the past. We are also going to look at a framework that allows us to dissect the concept community systematically. We share the interest for PR and the use of the digital in that realm – whether for commercial or non-profit, political or social justice purposes. Some challenges you identified (as in ‘questionable’ and ‘malfunctioning’): anonymity and lack of authenticity, slacktivism, ‘click and bait’ – force-fed content, hijacked content (e.g., hashtags ‘stolen’ and used for opposite purposes), lack of diversity (or, as Eli Pariser would say, filter bubbles), trolling — and forgetting the ‘community’ aspect in digital communities. These issues and interests will give us a roadmap for this course: They will provide us examples as to our analysis. I would also like to add two specific things: digital tools and work; and digital communities and new business models. II. Of Course I know What a Community Is… Right? But first things first: What is that ‘community’ in ‘digital communities’, actually? Unified body of individuals, state, species in a common location, group linked by a common policy…? As we can see from the dictionary definitions, there are many ways we can approach the idea and ideal of a digital community. Community has never been a static concept, and when studying digital communities we are also seeking new definitions, parameters, and norms for the concept. Your readings for next week, written by two sociologists, the theorizer of conditions of globalization Zygmunt Bauman (‘Overture’) and the summarizer of the concept of community, Gerard Delanty (‘Chapter 2’). They will give you an overview of how important the concept, and manifestations, of a community has been throughout human history. Believe it or not (and it is hard to do so in the times of online community managers), for a while the argument was that modernity, and its emphasis on the individual, killed the idea/l of community. It is clear, as Delanty notes, that we are witnessing a revival. It is also clear, as Bauman attests, that community is not a fixed idea but quite an elusive, perhaps Utopian, concept. You will also learn about the duel between society and community. These readings will serve you as a background for your assignment. Please read texts marked as [Week 1] on Dropbox: Bauman & Delanty. (2) Another TED Talk, by the Marketing Guru Seth Godin (click HERE). WHAT: Write an analytical comment under the theme “Approaches to Community-Building”, based on the videos/podcast. Use your readings as your theoretical guides. How can Delanty help you to understand the present? 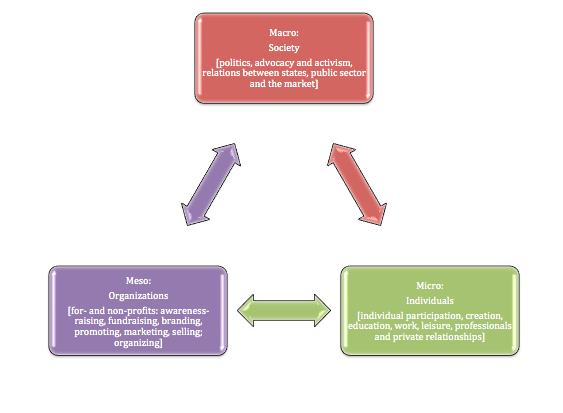 Also, when applicable, refer to the framework of layers/levels of communities (see above). Does the framework work for you in analyzing the talks? Take a position: Which views — Turkley, Godin, Brown — do you believe in; what seems irrelevant, untrue, utopian? Why? Questions you might wish to ask and answer are (but not limited to):Which talk best reflects my idea and understanding of communities and community building? Why? How/to what extent do the assigned readings relate to that talk? How can I utilize those texts to analyze and argue for the relevance of the viewpoints presented in the talk I find more relevant? And what is it about the talk I find the least relevant – what are the important aspects in that one; can the readings illuminate something about that talk? Finally, what is my most profound-take-away from these materials? Email me or post a question on Facebook if you have any questions! Undeniably the different points of view in technology were well explained, and their arguments touched on every emotions we might have in our relationship with technology. But I have to say that Turkle had my complete understanding. Yes, her argument could come up strong when expressing herself about how are these new “gadgets” disconnecting us from one another, but nonetheless, they are the truth. As one of her anecdotes explains, people worry more about broadcasting a moment than actually living it. The picture she showed about her daughter’s “fun night with her friends” are the typical picture of not only teenagers, but people in their 20s and 30s as well. We have become the generation of organic disconnection, and we do believe every conversation could be projected successfully through text. It is hard to think about community building with these barriers of presence, in conversations and even in sharing a simple afternoon together without being stuck to our phones. Of course now we know more than ever how to build a technological community, but, are we losing our personal interconnection in the process like she presents? My only disagreement with her argument was the by keeping technology so close to us, we could lose personal identity. She argues that all of our efforts to stay connected with technology more than to human beings, its going to makes us so dependable of it that even the use of robotic company would be necessary. The point was exaggerated just to make technology to look more aggressive than what it is. As Brown implied on his argument, we still see technology and social media as our most precious way of communicating, but by any means human interaction and company could ever be replace by a robot…? I like to think that as individuals we are still very much connected to the flesh when it come to affection and physical interaction, and we have grown out of the mentality that one day robots will rule our lives. I took from Brown’s point of view that technology could only be more helpful than not, and that one simple picture from a particular part of the world could change a lot of minds. But we cannot forget about connecting with other human beings when we have them around, and that a simple face to face conversation could be helpful as well as a text.